Rev. Matt Rawle, pastor of The Well United Methodist Church in Ponchatoula, served as host to the second annual “Wesley Awards,” held the evening of Tuesday, June 9 of AC2015: Come and See in the Gold Dome. 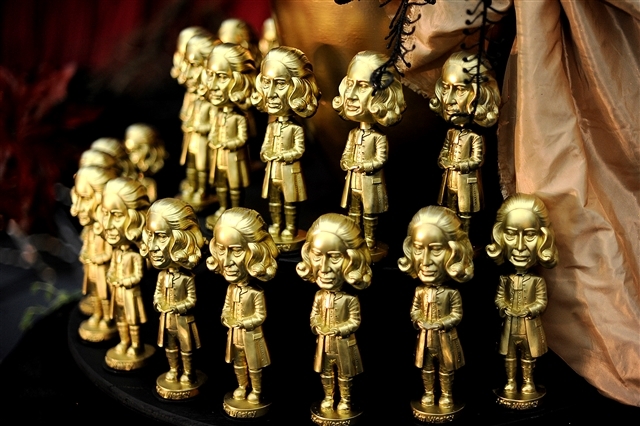 Winners of the award (a.k.a John Wesley bobbleheads! ), hailing from United Methodist churches from throughout the Louisiana Conference, were recognized for implementing creative ministries that embody our Conference Mission, Core Values and Preferred Vision. Ministries that were lifted up were submitted for review prior to the 2015 Louisiana Annual Conference. We went from 20 or so applicants last year to an abundance of over 75 applicants this year. It’s that kind of abundance that reminds us of resurrection. It’s that kind of abundance that reminds us of what it means to live a Christian life. Algiers United Methodist Church’s Prison Ministry began with a prayer, an idea and a small group of disciples who wanted to offer hope. Every month, the members of Algiers UMC regularly write letters and sends cards to 12 different inmates, leading to a partnership between the church and the Justice and Accountability Center of Louisiana. Through the church’s assistance, one young man found out that he was eligible to go to college to pursue his dream of being a nurse. Southeast Ministries of Broadmoor United Methodist Church in Baton Rouge has served more than 8,000 people over the last year with an unpaid staff of more than 100 volunteers. One woman came to Southeast Ministries because she lost her job and needed extra food to make ends meet. Many weeks later, she returned to the ministry, not for food, but to let Southeast Ministries know she had gotten a full-time job. First United Methodist Church of Slidell sponsors the “Feed Dat” ministry. Since the ministry began in October of 2014, Feed Dat has fed over 1,000 families in need. There is no screening process. All are welcome, just as all are welcome to the Lord’s Table. The Brown Bag ministry of Louisiana Avenue United Methodist Church started with a vision from one of Louisiana Avenue’s college students. Every month, Louisiana Avenue UMC serves more than 150 homeless living on the streets of Lafayette. The Brown Bag ministry reveals that love is the mission of the church. The church meets people where they are, just like Jesus meets us. Asbury United Methodist Church of Bossier City’s Katy Build was named in memory of Katy Watkins, a young girl in the Asbury youth group who gave her time to make a difference in the life of those around her. The first Katy Build, constructed for first-time military veteran homeowners, was the first new construction in the Scott-Dickerson neighborhood in almost 50 years. From idea to threshold dedication, the build took only 64 days. Lucas Prestenback, an eight grader who attends Bayou Blue United Methodist Church in Houma, decided that he wanted to feed the homeless. So he took it upon himself to contact Hope House and meet with Bayou Blue’s mission committee, challenging them to feed the hungry in their community. What began as a middle schooler’s idea is now a ministry that has fed over 100 people and started an ongoing relationship with Bayou Blue UMC and Hope House. St. John’s United Methodist Church in Baton Rouge started the “Consulado Movil de Mexico” so that the Mexican Consulate in New Orleans might help marginalized Mexican immigrants begin the path toward legal U.S. citizenship. The project helps immigrants update important documents so that they can remain in good standing in the United States. Since December, St. John’s has helped 300 Mexican families with the legal citizenship process. Chatham United Methodist Church in the Monroe District has discovered the power of movies to both share the Gospel story and build community. “Movies Under the Stars” offers family friendly movies in a community where there’s not much to do after dark. In a way, “Movies Under the Stars” embodies the light of Christ, the light that shines in the darkness, a light that will never be overcome. Faith Crossing United Methodist Church began the Hummingbird Lane ministry to offer a safe place for children to learn the Gospel story. What began as a place where children could receive help with homework has grown into a music ministry during which children use home-made and donated instruments to sing praises to God. The Hummingbird Lane Ministry now offers meals during Thanksgiving and provides Christmas gifts to the children during the holiday season. The Martin Memorial Garden and Labyrinth at First United Methodist Church in Gueydan has taken a more silent approach to sharing the Gospel story. Inspired by a memorial gift honoring John and Allen Martin, one of whom was a rose enthusiast, a prayer garden and labyrinth in the style of the labyrinth from the Chartes Cathedral in France was begun in February in 2014. With the help of a mission team from Missouri, a garden full of white roses, clematis, hydrangea, amaryllis and other flowers reminds the Gueydan community that a garden was God’s first gift to humanity. The after-school ministry of Vidalia United Methodist Church accommodates an average of 45 children every Tuesday, offering a place for snacks, homework help and Bible stories. Last year, the children offered a ministry for the church in leading the congregation’s Christmas program. Because of the after-school program, the community and the church have been blessed with the life-giving Gospel story. Louisiana Memorial United Methodist Church in the Acadiana District provides “Wesley’s Table,” a free community breakfast. The ministry began in February of2015 with a handful of volunteers committed to breaking down the barriers that too often divide our communities. What began as a feeding ministry has grown into a partnership with the local women’s shelter and a more inclusive and diverse congregation. “Village of Hope” and “Gumbo of Art, Music, and Culture” programs, hosted by Camphor Memorial United Methodist Church, are children’s outreach ministries for the Scotlandville community. Village of Hope reaches out to young children, providing them with academic enhancement through homework assistance and cultural enrichment. “Gumbo of Art, Music, and Culture” program invites older children to experience, through field trips and interactive workshops, the cultural richness of the Scotlandville community. Through Gumbo, children have learned about history, art, entrepreneurship and financial literacy. Wesley Chapel in Homer moved into an unused Southern Methodist Church building to offer a place of hospitality of families who were visiting incarcerated loved ones. This holy ground now offers an ecumenical worship experience and revivals and youth services for area churches. Through hospitality and worship, the “Seeds of Light” ministry offers lodging for families visiting loved ones at the David Wade Correctional Facility as well as GED classes, tutoring program, and Christmas gift program. Lifetime Achievement Awards: Louisiana Methodist Children’s Home and United Methodist Committee on Relief. Louisiana Methodist Children’s Home is a leading faith-based provider of behavioral health services statewide. More than 560 employees actively provide an array of ministries across Louisiana from home-based services to intensive, trauma-focused, residential care for children and adolescents with severe emotional and behavioral needs who are unable to live in less intentional therapeutic settings or at home even with community-based supports. Last year, the three children’s homes provided Louisiana’s most intensive, comprehensive and holistic residential care to 277 children. The agency’s community-based services touched the lives of nearly 20,000 people throughout our state. UMCOR is a ministry of The United Methodist Church through the General Board of Global Ministries. The agency’s goal is to assist the most vulnerable persons affected by crisis or chronic need without regard to their race, religion, gender, or sexual orientation. UMCOR’s work reaches people in more than 80 countries, including the United States. The agency provides humanitarian relief when war, conflict or natural disaster disrupt life to such an extent that communities are unable to recover on their own. Louisiana was the recipient of close to 26 million dollars in aid from UMCOR during our recovery from Hurricanes Rita and Katrina. While UMCOR cooperates with other aid organizations to extend its reach, the agency’s most important partners are the people served. UMCOR is confident that successful solutions to emergency or chronic conditions begin with the affected population. UMCOR provides these survivors not only temporary relief but long-term education, training, and support. UMCOR spends 100 percent of designated donations on the projects specified by donors. Leading others into abundant life in Christ. Engaging with our surrounding communities locally and globally in significant ways. Learning, living and telling the gospel story to the nations. Reaching out and drawing in people from all walks of life resulting in vibrant, alive and vital congregations. St. John's UMC; Consulado Movil de Mexico"
Asbury UMC, Bossier City; Resolution 2015! Wesley Chapel UMC, Homer; S.H.A.P.E.